You will get the message InLoox Work Packages after you have chosen InLoox PM as notification type. Open the related project Choose one work package from the list and click Open project. 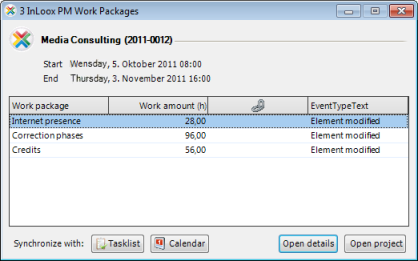 The notification type is selected by the project planner. Users without InLoox PM can only be informed via task request, meeting request or email. The project planner can also decide not to inform the resource. How to show and edit work packages | InLoox PM 7 • Copyright 1999-2019 © InLoox, Inc. All rights reserved.